Heat the broiler. Lightly oil a broiler pan or baking sheet. Put the fish in the pan and rub the surface with the oil. Sprinkle with the chopped or dried thyme, the salt, and pepper. Dot with the butter. Broil the fish until golden brown and just done, about 4 minutes for 3/4-inch-thick fillets. Decorate with the thyme sprigs, if using. Serve with the lemon wedges. Fish Alternatives There's nothing quite like shad. Still, this is a good basic broiled fish recipe to use with other fish fillets, such as red snapper, sea bass, striped bass, pompano, and bluefish. 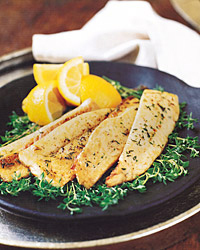 Variation Broiled Shad with Oregano: Use 3/4 teaspoon fresh or 1/4 teaspoon dried oregano in place of the thyme. The richness of this simple preparation is delightful accompanied by an acidic Chardonnay. Look for a reasonably priced Mâcon-Villages or Chablis, both from Burgundy in France.